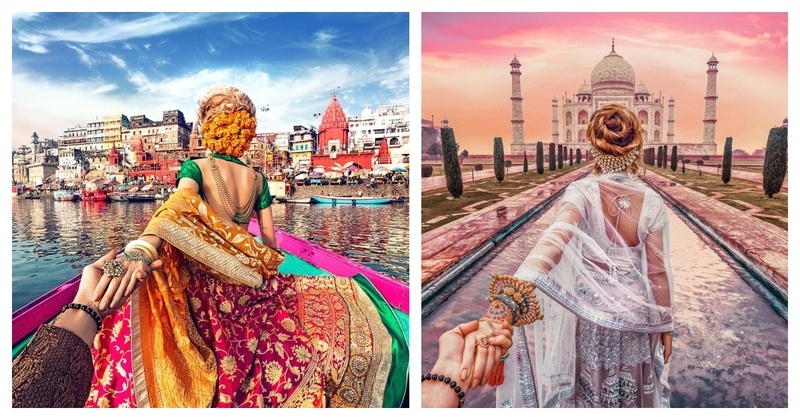 Love & Travel is a magical combination and these couple pictures are a must-have for the travel enthusiasts! After your kundalis match (or not “Hello millenials”) we’re sure you know, that love is no longer just in the air - it has to be in your pictures too :D! Mix love with a bit of travel and you have the recipe for magic and who better to take inspiration from than the #followmeto couple? Murad Osmann - the photographer whose pictures can give major travel #FOMO to anyone will give you major couple photos inspo too! He and wife Nataly Zakharova, are responsible for the #followmeto Instagram trend that they started back in 2013 with their creative “Follow Me” travel series from New York, Paris, London and beyond and it’s something that never stopped trending. 𝔽𝕆𝕃𝕃𝕆𝕎𝕄𝔼𝕋𝕆 𝕆ℝ𝕀𝔾𝕀ℕ𝔸𝕃𝕊 #Followmeto Hawa Mahal - a Palace of Winds which is located in the heart of the beautiful Pink City of Jaipur in India. It is built in a shape of a crown and has 953 small windows which were built to keep the wind blowing inside the palace. The idea was that royal women could watch the daily life of the city through the windows without being visible to public. It doesn’t have a direct entrance and you have to enter it from the side. ❍❍❍❍❍❍❍❍❍❍❍ #следуйзамной в Хава Махал - Дворец Ветров, который находится в сердце прекрасного розового города Джайпур в Индии. Он был задуман в форме короны индуистского бога Кришны. Здесь очень много окон (а именно 953), чтобы женщины спокойно могли смотреть на оживленные улицы и не быть замеченными. ● 𝟛𝟛 ♕ ƁƖƦƬӇƊƛƳ ♕ ● It’s just a beginning! #followmeto the Blue city of Jodhpur with @natalyosmann. Tell us the country you are from? We are from 🇷🇺Russia for example... Follow us on 👻snapchat👻: FollowMeTo. #следуйзамной в Индию в город Джодхпур. #followmeto Jodhpur with @natalyosmann. We are happy to continue our collaboration with @bazaarbridein #следуйзамной в Индию, город Джодхпур. В это воскресенье в 10:10 на Первом Канале мы расскажем вам нашу историю Индии. ___________________________________________ big thanks to @mohitrai and @nupurmehta18 for styling and making everything happen. #followmeto the amazing and colorful Jaipur with @natalyosmann. Follow us on 🎥periscope🎥 for more videos: Nataly Osmann. Подписывайтесь на наш periscope: Nataly Osmann. #followmeto Hampi step well with @natalyosmann. 🌐Which places you would suggest us to visit? 🌐 👻Follow us on Snapchat: FollowMeTo👻 #следуйзамной в Хампи, в Индии. #followmeto Festival Holi in Varanasi with @natalyosmann. This is was the most fun and my favorite from the shoot :)! 👻Follow us on Snapchat: FollowMeTo👻 #следуйзамной на фестиваль Холи в городе Варанаси. #followmeto the Holi Festival of Varanasi with @natalyosmann. #следуйзамной в Индию на праздник Холи в городе Варананси. Кстати прям сейчас идёт передача наша на Первом Канале об Индии. Что думаете? Mesmerising isn't it? Well, what are you waiting for, just choose a location, pack your bags, talk to your official photographer or your hubby photographer and have some amazing couple pictures clicked to be remembered for a lifetime already!